I was afraid this would be too boring. Instead, it makes me think of an old fashioned sepia photograph. 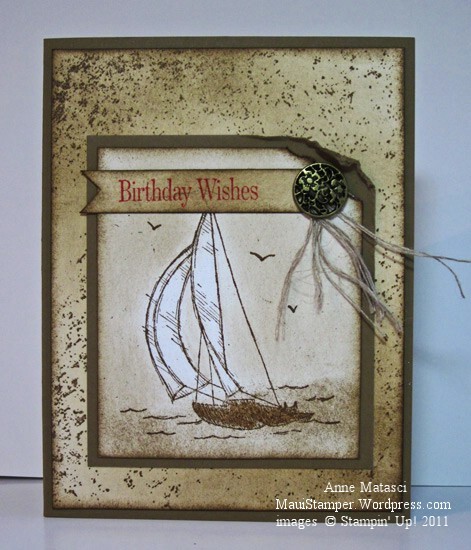 The sailboat is stamped on Naturals White cardstock and I used Stampin’ Sponges to brush just about every surface except the sails so that they would pop out. The banner and background are Naturals Ivory, which makes the white stand out even more. The perfect “V” at the end of the banner is made using the corner of the square punch. There’s a little tiny flag at the top of the mast, and I colored it with the Poppy Parade marker, but I didn’t get the proportions right and so the banner covers it up. Shoots, it’s only paper.